Ground Name: Moss Lane Capacity: 6,085 (1,154 seated) Address:Moss Lane, Altrincham, Cheshire WA15 8AP Main Tel No: 0161 928 1045 Fax No: 0161 926 9934 Pitch Size: 110 x 74 yards Team Nickname: The Robins Year Ground Opened: 1910 Home Kit Colours: Red & White Official Web Site: www.altrinchamfc.com About Moss Lane Another classic Non-League ground, having been home to the club for many years. On one side of the ground is the Carole Nash Insurance Main Stand. This is a small single tiered all seated stand that sits astride the half way line. An old classic looking stand, it has glass windshields on either side, plus a number of supporting pillars, one of which is centrally located at the front of the stand. Views of the pitch may be further impaired by two small floodlight pylons that are located at the two front edges of the stand. On one side of this stand is a smaller separate structure, the Goodwin Family Stand. This is a very small covered all seated stand. On the other side of the Main Stand is a small open terrace that is only a couple of large steps high. Opposite the Main Stand is the Popular Side. This is a covered terrace that runs the full length of the pitch, made unusual by having a section in the middle that has a higher roof compared to either side. At the Golf Road End is a small covered terrace, whilst opposite the Hale End is a small open terrace. 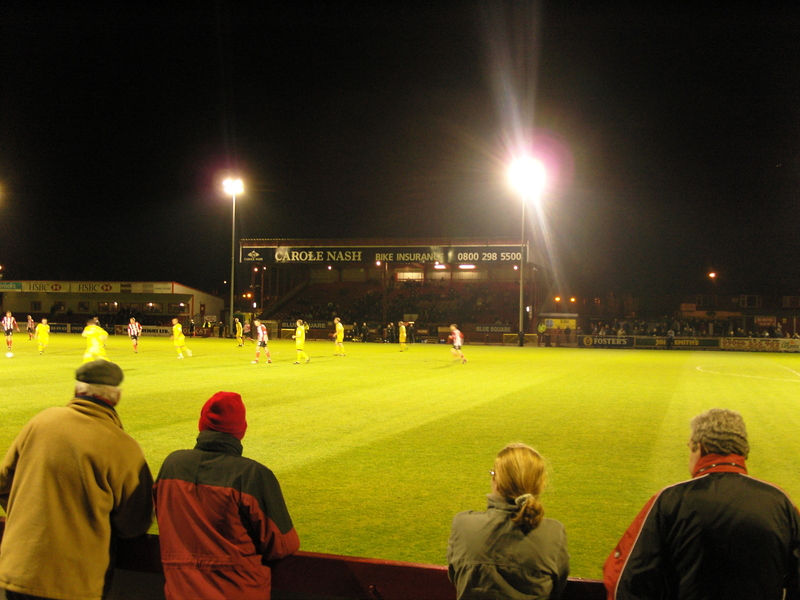 Moss Lane is completed with a set eight floodlight pylons, which run down each side of the ground (four on each side). How to get to Moss LaneIf you are driving from from the south, exit the M6 at junction 19 and take A556 signposted Manchester Airport. When you get to the M56 roundabout go straight on and pick up the signs for Altrincham and then the football ground. From the north exit M6 at junction 20a onto M56 and exit at junction 5 then as south. It’s street parking for all around the ground. How to get a ticket for Moss Lane As with virtually all Conference grounds sell outs are unheard of so you can buy your tickets on the gate. Adults can either pay £12 to stand or £14 for a seat and its £5 for concessions and just £2 for the under 12’s. About Our Last Visit – Altrincham 2 Eastbourne Borough 2 – 8th April 2009 I had already emailed the club and vice-chairman no less Grahame Rowley had said just come to the players entrance and ask for him if we had any issues getting in. As all the gates were locked we went to said entrance and the officials couldn’t have been any nicer – shown straight into the bar, beer for me, cokes for the Little Fullers, programme thrust in hand and a quick summary of events of the first half from one of the Altrincham coaching team! It definitely sounded like I had missed the wrong game as this seemed like a belter. Two one to Eastbourne, but the quality of all three goals sounded impressive. Ben Austin’s 2nd for Eastbourne was the pick of the bunch and would have been lauded 6 miles down the road at Old Trafford let alone Moss Lane. We followed the teams down the tunnel and took our (free) seats in the main stand. Altrincham’s ground is brilliant. Everything that is right about non-league football with small terraces and loads of obscure advertising boards. 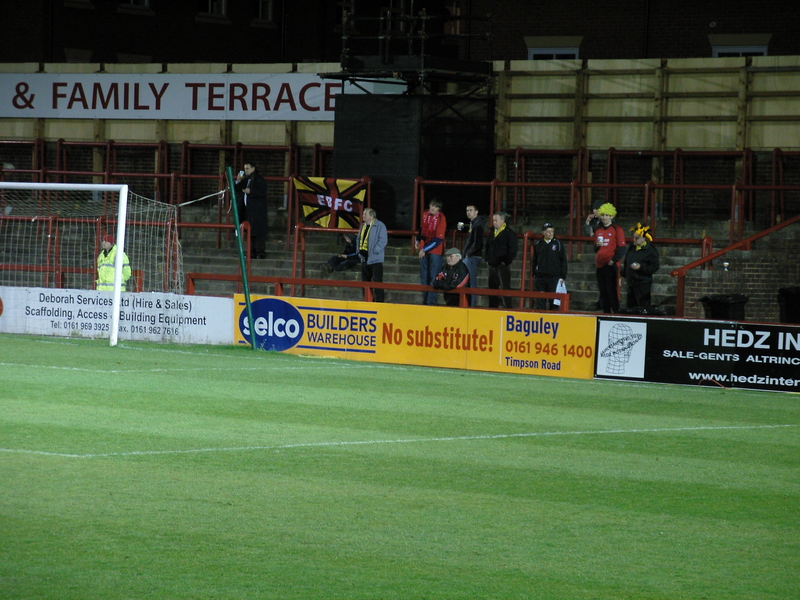 The away fans (all 16 having made the 300+ mile trip from the south coast) were on the “Carole Nashe & Family Terrace”. Obviously they could have been part of the Nashe family, but I think it does take segregation to the extreme if one person and her family get their own part of the ground. We hadn’t missed any of the action in the second half which was perfect. Both teams were obviously desperate for a win despite their safe mid-table status. This was the first opportunity I had had to watch young Jeffrey but he seemed relatively anonymous. He will certainly have to raise his game if he expects to be competing with the current crop of youngsters at West Ham such as Junior Stanislas and Zavron Haines for a first team spot. On sixty minutes the referee decided he could not continue. As with the case at Woking earlier in the season a call has to be made for a local referee to act as Fourth Official whilst the other officials swap around. One of the ground staff was called by name over the PA and shortly appeared in jeans and smart jumper and was swiftly given the coat and the Sub’s board to manage. 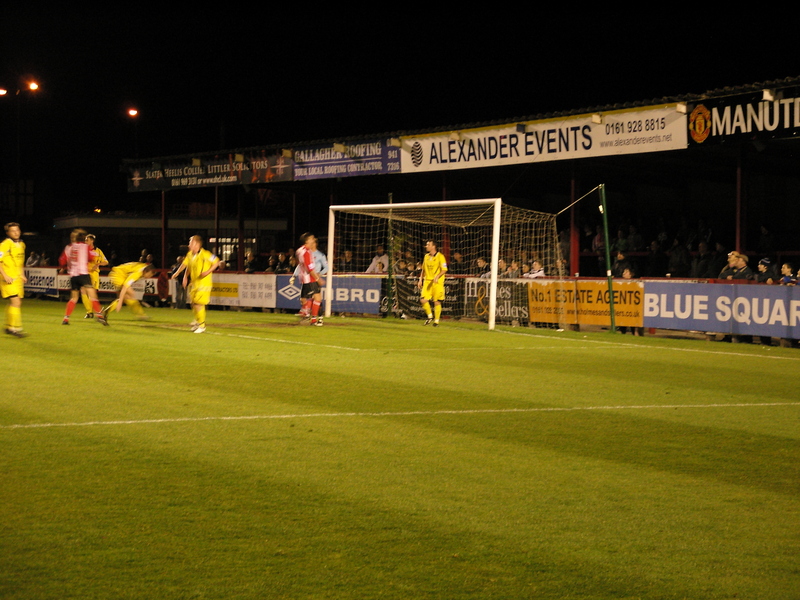 On seventy minutes Altrincham earnt a free kick on the edge of the area which seemed harsh to say the least. Up stepped Shaun Densmore to curl the ball over the wall and into the net to draw the scores level. It seemed both teams then were happy to play out for a draw – Altrincham created a couple of openings, none better than a fantastic drive from 20 yards on the run by Colin Little in the last few minutes. So with the final whistle blowing we were off and the teams happy with a draw, we were off for our long drive south. Both girls were on the snooze express by the time we hit the M6 and we would have been home by 12.30am if it wasn’t for the usual night time M1 and M25 roadworks that see 3 out of 4 lanes coned off and no one working. So at 1am we arrived home. CMF greeted us at the door (she worries when I have to drive home late at night) and both girls woke up excited to tell her about their day. So I did it – two games in 90 minutes. Northwich had scored a second in the second half to win 2-0 and keep their slim hopes of survival still alive. It’s not something I would recommend doing all the time but hats off to Grahame Rowley and the officials at Altrincham who were marvellous. Shame their Forum administrator doesn’t want to let me on their message board to post my thanks but such is life.